The diagnosis is a different kind of blow. After surgery and months of a long rehabilitation process, most patients never regain their full pre-injury strength. One in three NFL players who tear an ACL never play professional football again. Young athletes’ careers can stall before they begin, and even weekend warriors face a greater likelihood of arthritis and knee replacement surgery in the decades following injury. To improve the odds of the nearly 250,000 people a year who injure their ACLs, a team of researchers at the University of Michigan is investigating insights that may be gained from a controversial but potentially medicinal substance, human growth hormone, or HGH. Because of its status as a performance enhancing drug, HGH is rarely studied in sports medicine. As a result, surprisingly little is known about its biological effects. In a new double blind trial, U-M researchers are administering HGH to patients just before and after ACL surgery, to see if it can stave off muscle loss to give athletes a more complete recovery. “We’re using this as a pilot study to give us some fundamental information about HGH,” says Asheesh Bedi (M.D. 2002, Residency 2007), the Harold and Helen W. Gehring Professor of Orthopaedic Surgery and chief of Sports Medicine and Shoulder Surgery and the MedSport Program. Bedi and his colleagues had to overcome a series of hurdles just to begin studying the hormone. They say the U-M’s stellar reputation as a leader in medical research has helped them land funding — from the billionaire owner of a basketball franchise, no less — and correct some misconceptions about HGH by better understanding how it affects the body. “What has made this possible is the sound experimental design and the environment that the U-M offers to do this responsibly and ethically, to eliminate that cloud of suspicion surrounding HGH. We are not looking in any way at performance enhancement. Rather, we are investigating the potential medicinal applications to improve outcomes and help patients, not just athletes, recover from can otherwise be career-ending injuries,” Bedi says. HGH is a hormone that stimulates cell growth and cell regeneration. In its synthetic form, HGH is available only by prescription and only for a short list of approved indications, including childhood growth disorders and wasting disease. In a legal gray area, HGH is sometimes prescribed for supposed anti-aging effects, which are not well-documented. It does shrink fat and cause muscle tissue to absorb water, improving definition, or tone. Despite the bans against it, however, HGH may not enhance athletic performance when taken on its own. Christopher Mendias (Ph.D. 2007), assistant professor of orthopaedic surgery and molecular and integrative physiology, said that unlike anabolic steroids, HGH doesn’t markedly increase muscle strength or mass. Instead, HGH prevents the degradation of muscle and helps protect tendons and ligaments. Mendias became interested in HGH as a possible therapy years ago. He read about a study from the University of Copenhagen, where muscle atrophy was induced in healthy men. Subjects in their 20s were fitted with a hip-to-ankle cast for two weeks. Half of the men self-administered daily HGH, the other half a placebo. After the casts were removed, the group that took HGH had lost less muscle than the placebo group. And after six weeks of exercise, the group that took the hormone was able to regain full leg strength, while the placebo group never did. A former athletic trainer, Mendias says the findings made him think of athletes he’d worked with who missed so many months of training following ACL surgery that they never reached their prior level of performance. Research funding can be political. When a rash of Major League Baseball stars were caught cheating by taking anabolic steroids, for example, Congress responded by cutting funding for steroid research, despite the drugs’ medical uses. One day Mendias, an avid sports fan, read an article on ESPN.com in which Mark Cuban, owner of the Dallas Mavericks, admitted he was curious about HGH and would like the NBA to consider researching it. Mendias happened to know the Mavericks’ athletic trainer, so he sent an email, asking to be put in touch with Cuban. Eventually, Cuban’s eponymous foundation granted $800,000 to Mendias, Bedi and the U-M team for a double blind clinical trial of 50 men, ages 18 to 30. Because HGH is banned, none of the participants may play for NCAA or leagues subject to doping regulations. The study had to get additional approval by the U.S. Food and Drug Administration for its off-label use of HGH. The human knee is made up of three bones. Four major ligaments hold them together while allowing movement, like a set of perfectly threaded rubber bands. The ACL, which crosses the inside of the knee diagonally, is vulnerable to snapping apart, especially in sports that require quick stops and changes of direction, such as soccer, football and basketball. About half of all ACL tears involve injuries to other parts of the knee as well. Patients who tear an ACL usually spend a few weeks resting and icing the knee to resolve swelling before surgery. 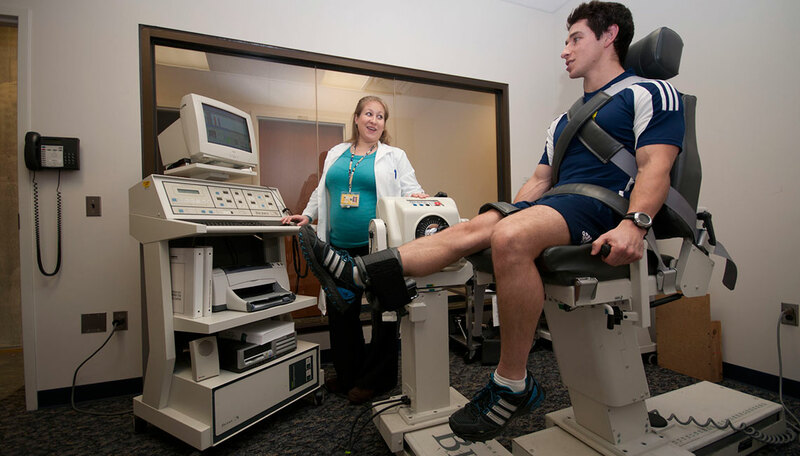 When a patient with an ACL tear is enrolled in the new U-M study, he undergoes strength testing and high-resolution magnetic resonance imaging of both knees. The high-resolution imaging is performed by Jon Jacobson, M.D., professor of radiology, to evaluate the size and composition of the leg muscle groups. That’s because one of the goals of this study is to understand the potential effects, if any, of HGH on the healthy knee as well. Despite all of the bans on HGH, its performance-enhancing effects are not well documented. Patients in the study self-administer the HGH — or, in half of the patients, a placebo — by subcutaneous injection, twice a day. Treatment begins one week before surgery and continues for six weeks. In addition to periodic MRIs and strength testing, to gauge recovery, each patient has regular visits with an endocrinologist. Ariel Barkan, M.D. (Fellowship 1993), professor of internal medicine, has studied HGH for other uses, and joined the research team to help determine dosing. Barkan, as well as Joel Gagnier, N.D., Ph.D, assistant professor of orthopaedic surgery and epidemiology, and Troy Henning, D.O., assistant professor of physical medicine and rehabilitation, monitor the well-being of the subjects. The outpatient surgery is performed arthroscopically. The torn ligament has frayed ends, like the fringe of a mop, that make it unsuitable for repair. Instead, a rope of hamstring or patellar tendon is harvested as a graft from the patient. Holes are drilled into the tibia and femur. The graft is laced through the holes and fixed into place. Then the long work of rehabilitation begins. Bedi says that despite his scientific curiosity about this research topic, he did feel some personal concerns to study HGH research because of its clouded reputation and ban in sports. Bedi has a long resume of treating elite athletes. He is currently a team physician for U-M and Eastern Michigan University, and a medical consultant for the players’ associations of the NBA, NFL and NHL. In sports medicine, he says, reputation is paramount. Teams aren’t going to call on anyone who does not have the highest of ethical and moral character in doing right by their patients. Suspicion about doping, though, isn’t reason for the entire medical community to reject a particular drug, Bedi says. Pain medications, for example, are critical to cancer care and post-operative pain management, despite the fact that some people abuse them. He added that the potential benefit is enormous. Bedi performs 125—150 ACL repairs each year. Bedi adds that ACL surgeries are likely to become even more prevalent, as youth competitive participation in cutting and pivoting sports continues to grow. “We know that a successfully healed ligament is sometimes not enough … significant strength loss and weakness that does not improve may result in just the reduction in speed and agility to end an athletic career. We see it commonly with atrophy of muscles after revision surgery,” Bedi says. Patients who have had ACL reconstruction are more likely to experience arthritis in the decade following surgery. By restoring strength after the injury, HGH could help to prevent the onset of arthritis. Jonathan Gumucio, a Ph.D. candidate in the Department of Molecular and Integrative Physiology, is leading the analysis of biochemical markers of arthritis that can be detected from patients’ bloodwork. And the trial could have implications beyond knees. While the researchers are focusing on ACL tears for homogenous data, a similar problem pervades everything from Achilles tendon ruptures to hip fractures. “When we apply a cast to a patient, to immobilize a bone, within a week to two weeks there can be profound atrophy. The rotator cuff and deltoid are similarly affected after shoulder injuries in our workforce or after traumatic injuries,” Bedi says. Even if the study results are positive and can be replicated, the researchers foresee another chain of hurdles before the treatment could be used. Physicians would have to reconsider a widespread perception of HGH as a doping agent. Surgical recovery would have to be approved as an indication for HGH prescriptions. And athletic organizations might have to revise their anti-doping policies regarding HGH.